As continuing research confirms that skilled teachers are key to children’s academic success, school districts across the country, often working with their unionized staffs, are scrambling to recruit, reward and retain the most effective educators. Clearly, they don’t know the United Federation of Teachers and its national parent organization, the AFT. From their beginnings, the American Federation of Teachers and its affiliates have advocated for accountability and the highest professional standards for teachers. The UFT has, over the past 30 years, redoubled its efforts to ensure quality teaching in the city’s schools. To raise teachers’ status as professionals, like doctors and lawyers, the UFT’s Albert Shanker long argued that teachers should assume responsibility for their own postgraduate training. In 1978 the federal government agreed to try his approach. Teacher Centers were founded on the radical premise that professional development for teachers could best be conducted on site by teachers themselves, master instructors who were familiar with the classrooms and students that their colleagues faced every day because they were there, too. In 1980, the New York City Teacher Center Consortium, a UFT pilot program funded by a federal grant, began in eight schools. Today it is a joint union-board program, funded by the state and city and operated by the UFT. Its 250 sites across the city offer in-classroom coaching and support, workshops tailored to each school’s specific needs and an array of helpful instructional materials. It also runs a virtual “UFT University,” so called because of its hundreds of in-service and college-credit courses. UFT members can even earn a master’s degree through the Teacher Center’s program in affiliation with local colleges. All together, about 10,000 city teachers take advantage of Teacher Center offerings each year to hone their skills. In addition to taking responsibility for helping teachers succeed, the UFT has been a pioneer in recognizing outstanding teachers while helping struggling teachers to improve or leave the profession. In 1987, responding to criticism that it was time consuming and costly for administrators to substantiate charges of teacher incompetence, the new UFT president, Sandra Feldman, offered a plan to address the issue of floundering tenured teachers — those whose skills had eroded or were no longer responsive to changing student needs. This voluntary, confidential, nonevaluative Peer Intervention Program used veteran, master teachers as “intervenors” to provide intensive, one-on-one classroom coaching to tenured teachers who had been or were about to be U-rated. The intervenor could also counsel the teacher out of the profession, if necessary. Later, the program added services such as counseling, alternative career guidance and job placement assistance. The concept initially met with some resistance from administrators who saw the program as usurping their responsibilities, but PIP had one major advantage: teachers were not as reluctant to reveal their weaknesses to a peer as to a supervisor who might penalize them. The approach was spectacularly successful. Of 57 participants who completed the program’s first year, 43 received Satisfactory ratings and stayed in the classroom, one was suspended for incompetence and the rest transferred to non-teaching positions, sought other work or retired. Most recently, in 2008-2009, of the 98 participants completing the program, 54 received S ratings while nine were counseled out of teaching. 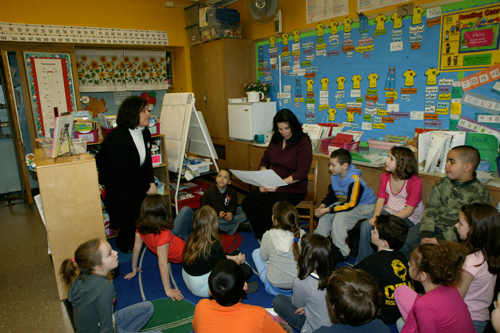 PS 53, Staten Island, is one of 250 schools across the city that has its own Teacher Center site. It allows Teacher Center literacy coaches like Annmarie Hogan (left) to collaborate with teachers like Christine Pellikan in their classrooms. On the other end of the spectrum, the UFT has launched several initiatives that reward excellence. Based on the recommendations of a 1991 internal task force report, the union advocated for opportunities for outstanding educators to advance in the profession, take on additional responsibilities and earn extra money without leaving the classroom. One of these, the Lead Teacher Program, was adopted in 2004 in one of the city’s poorest school districts. Frustrated by years of failing schools and poor student performance, parents and community members in the Bronx’s District 9 worked with the union to analyze and address their educational needs. Calling themselves CC9 (for Community Collaborative in District 9), they soon homed in on high teacher turnover and a lack of experienced teachers as a key issue. The solution? Again the union called on its most skilled members. With the union’s help, CC9 recruited 36 top teachers who would share positions in 10 schools and earn an additional $10,000 each. These “lead teachers” taught half time and spent the other half a day doing professional development with individual teachers and groups. Their own classrooms often served as observatories for other teachers and as laboratories for developing strategies tailored to the students’ needs. In its first year, the project achieved all its goals and then some. New teacher retention rates improved dramatically. Student performance rose. And the professional, collegial atmosphere combined with the prospect of classroom help greatly aided teacher recruitment. In 2006, the Lead Teacher Project went citywide, expanding to 200 lead teacher positions, and is now a part of the UFT/DOE contract. Recently, as the public has demanded greater “accountability” from schools, the call from political and education leaders for “merit pay” for teachers has grown louder. For years, UFT President Randi Weingarten resisted demands from Mayor Giuliani for an individual merit pay plan because she believed it would foster competition rather than the cooperation that is necessary for school improvement. In 2007, however, she negotiated with Mayor Michael Bloom­berg a compromise that responded to her concerns and increased teacher pay. The Schoolwide Bonus Program awards an average of $3,000 to every UFT member in a participating school that raises student achievement through staff collaboration. In the last two years, the 200 participating schools earned more than $52 million in bonuses. Those were distributed among approximately 10,000 members each year.